Weiss-Stationery | Why Buy Local? Every time you spend money on goods or services, you have the opportunity to make a difference in your community and the world. When you spend your money at local businesses and buy locally-produced goods and services, you're choosing to reinvest in your community and helping to create a stronger local economy and healthier more sustainable world. Strong local economies are essential to sustainable community development and the healthiest economies are those that connect economic development to meeting the communities’ social and environmental needs. That’s why “buying local” can make such a powerful difference – we are connecting our economic choices to our values and a vision of what kind of community we want to live in. 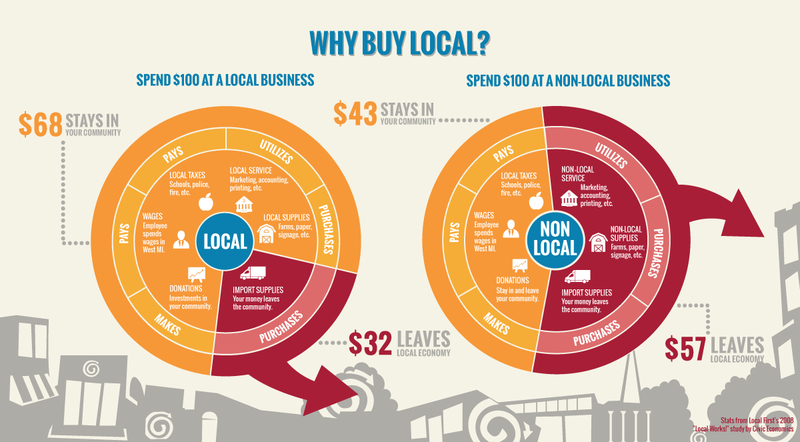 Ways Buying Local Makes a Sustainable Difference. Non-profit organizations receive an average 250% more support from smaller locally-owned business owners than they do from large businesses. Community-based businesses compete on being responsive to their customers’ needs. As a result, local businesses often hire people with a better understanding of the products they are selling and take more time to get to know customers. For every 2 jobs a national retailer brings to a community, 3 higher-wage jobs are lost due to local businesses closing. Small local businesses are the largest employer nationally and in our community, provide the most jobs to residents. The money you spend locally re-circulates in the community for 2 to 3 times the economic impact of dollars spent at national retailers. (Studies show that locally-owned businesses generate a premium in enhanced economic impact—For every $100 spent at a locally owned business, $68 goes back into the community and our tax base. For every $100 spent at a chain store, only $43 comes back).